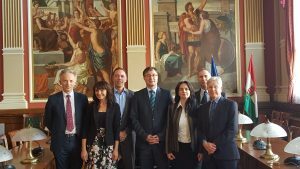 Budapest Business School completed the NIBS accreditation process on 20 October 2017. The picture of the NIBS accreditation team and Senior Management at BBS was taken in the University conference room. The walls are adorned with original works by two leading Hungarian artists of the late 19th Century.